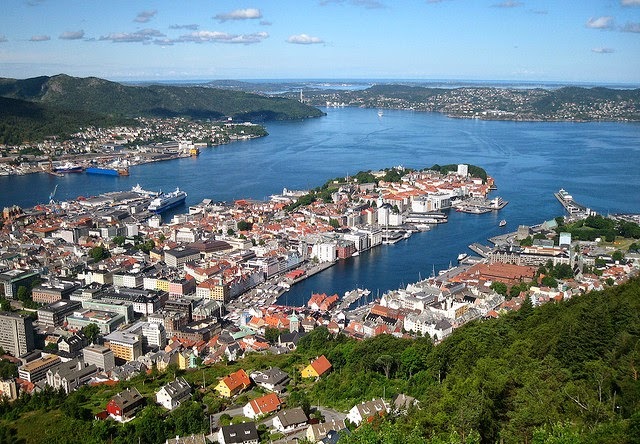 Bergen is a wonderfully Norwegian town: nestled along fjords and cliffs, facing the rough Atlantic seas and its back turned to the steep Norwegian mountains. It's an old harbor town with a lot of history, having been the capital of Norway back at the end of the Viking days, and it later became the biggest port in the Hanseatic fish trade. The route as seen from above: run out the peninsula and then around the harbor on the right. Photo by Airflore. If you like waterfront, vistas, surprising little neighborhoods, old forts and mountains, this is a great place to run. There are hills all over town, but this route sticks to the lower parts of the old town center, avoiding the biggest hills. Let's start the route in the town park, the Byparken, at the paved Festplassen (Celebration Square) at the little lake. Turn west and run past the little bandstand and keep going uphill along the tree-lined street towards the Nationale Scene theater straight ahead. On the way, you'll pass a tilted, rectangular stone in the street, "The Blue Stone", the spot where the route will loop back to itself later. 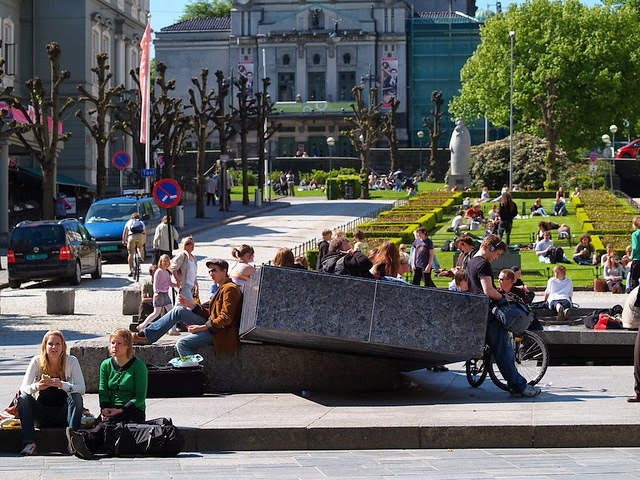 At the back end of the theater, turn right onto Teatergaten, and run for a block until you get to Markeveien. Here you turn left and run straight out the peninsula ahead, with a bay to each side. On the right, you'll run past the first of three spots on this run with twisty San-Francisco-Lombard-Street-like zig-zags, winding down towards the water on the right. But keep going straight along Klostergaten as it follows the crest of the peninsula. There are two spots where a narrow park lines the street to the right side, where you can follow the park path instead of the sidewalk along the street, but even the sidewalk is scenic: you get occasional views to the south over the main harbor past the nice old wooden houses of this pleasant neighborhood, called Nordnes. The street name changes to Haugeveien as it approaches a little fort on the left. Run past the stone walls of the fort, until you see the building on the left with the strange artwork and clock, and run up the ramp-like trail on the left at the sign for the "Høgskolen" (college). The paved trail takes you to an overlook over the bay to the south, with its modern harbor. Now turn right and enter the park ahead (Nordnesparken), following the path as it heads downhill to the tip of the peninsula at the water's edge. When you reach the benches at the lookout spot at the tip of the peninsula, you have reached the 2-km mark. Now exit the park at the north end and you'll find yourself running eastwards along Strandgaten. The docks of the old harbor are just off to the left side. When you reach a little parking lot on the left side, across from the second Lombard-Street-zig-zag on the right, turn left to run to the waterfront street, "C. Sunds gate", and turn right to run past the docks. This isn't the most scenic street in town: most buildings are charm-free boxes from the 1960s, but waterfront is always good. Just keep running eastwards until you reach the eastern tip of Bergen Harbor, where you turn left to run through the big waterside market square. There are now fish restaurants in the old fish-market building, called Zachariasbryggen. After the market, turn left to continue following the harbor, this time along the northern shore, heading west. 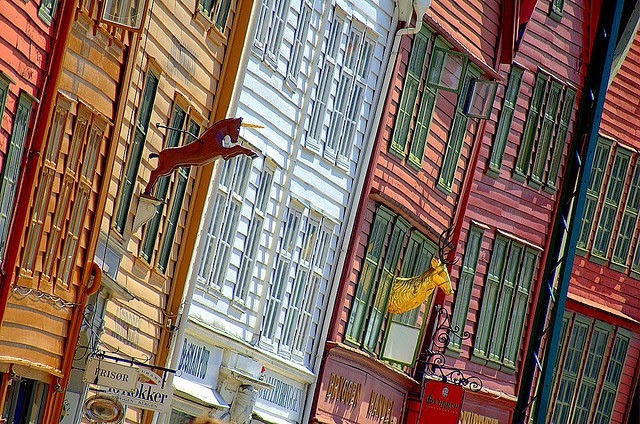 In just a couple of blocks, you'll want to cross to the right side of the street and get a closer look at Bergen's most famous sight: the old Hanseatic merchant's buildings, the "Bryggen". It's now a UNESCO World Heritage Site. The old warehouse buildings stretch for a long way behind the street, and were once full of Norwegian fish and European grain. This is the oldest part of town. 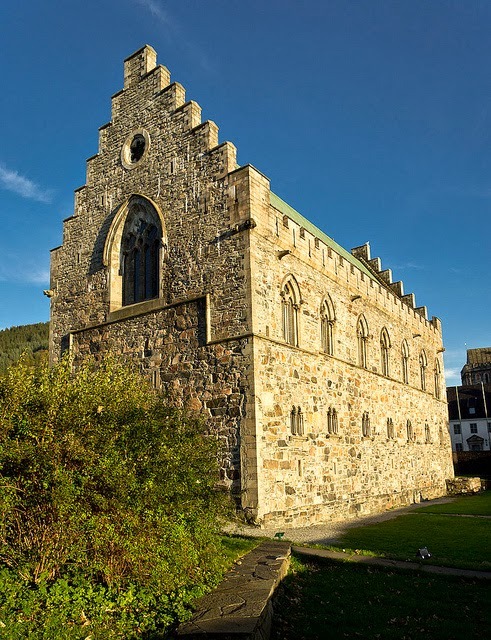 Continue westwards, and you'll see stone walls ahead of Bergenhus fort, an ancient castle with the Norwegian kings' residence from the time when Bergen was the Norwegian capital. The stepped gables of the Gothic building inside is 800-year-old Haakon's Hall. The Norwegian Navy still uses the castle as a base. You've now reached the 4-km mark. Continue running westwards below the castle's stone walls until you get to the end of the harbor, at the ferry terminal. Turn right to continue running next to the castle, with the open water to the west. Just past the end of the castle wall, when you get to the zebra stripes at the first wooden house, turn right to run up the little lane called Skuteviksveien. You're heading uphill between pleasant wooden houses along a cobblestone street. When you get to the first real cross-street, Fylkesveg, turn right and follow it as it curves a few times, first past some boring apartment blocks, but then past more nice wooden homes. After you pass the old stone St. Mary's Church with the twin towers, you'll start running by the back side of the Bryggen, with the park-like back-gardens behind the warehouses, and some stone foundation ruins. The street-name changes to Øvregaten here. Past the Bryggen, the street becomes an old shopping street. The street ends at a square with the little white building on the left for the "Fløibanen". This is a funicular railway that takes people up to Mount Fløyen, 320 meters above you to the left. Lombard-Street-Number-3 zig-zags its way up the hill behind the station. NOTE: This is the start of another great run: head straight up the hill and then run around through the wilderness at the top, with breathtaking views in many directions. There are several trails all leaving from the top of the zig-zag above the Fløibanen train station: the Fjellveien, Tippetue, and Fløysvingene trails all switchback their way gently to the top. I've run it and it was one of the most memorable runs I've ever done, but then I didn't have much time left to run in the wilderness at the top. So, if you want to save your energy and time for the amazing country up there, take the Fløibanen train up. The trains leave every 15 minutes, and get you up to the top in just about 7 minutes. Running to the top, I saw women doing Nordic walking and I understood for the first time what it's really about: They weren't just dragging their sticks uselessly behind them, but were hiking up a mountain face, using the sticks to exercise their arms and to take the load off their knees. For the first time, it all made sense. But that's another run. 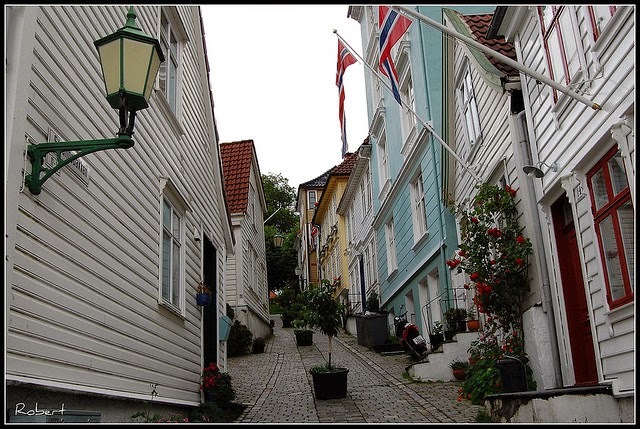 Ahead of you now are the narrow lanes and wooden houses of Skansen, maybe the most charming Bergen neighborhood, because the little houses are all situated along the hillside, with narrow lanes between them and occasional views out over the town and fjord. Just run straight into Skansen along Lille Øvregaten (Little High-Street) for two blocks until you come to Øvre Korskirkeallmenningen, a wider street that almost looks like a market square. The most charming houses and lanes are just up the hill from here, to the left, so make sure you take time to wander around up there later. But this route will now turn right and head downhill, back into the downtown. Run past the leafy churchyard of the Korskirken until you come out into the square called Vågsallmenningen, with the statue of Ludvig Holberg in his three-pointed hat, a famous Norwegian writer. You are now across the street from the fish-market. Run through the square to the main street across from the market, Torget, and turn left and run the four blocks back to the Blue Stone again, where you turn left and run the last 200 meters back to the town park.